My mum is my superwoman. 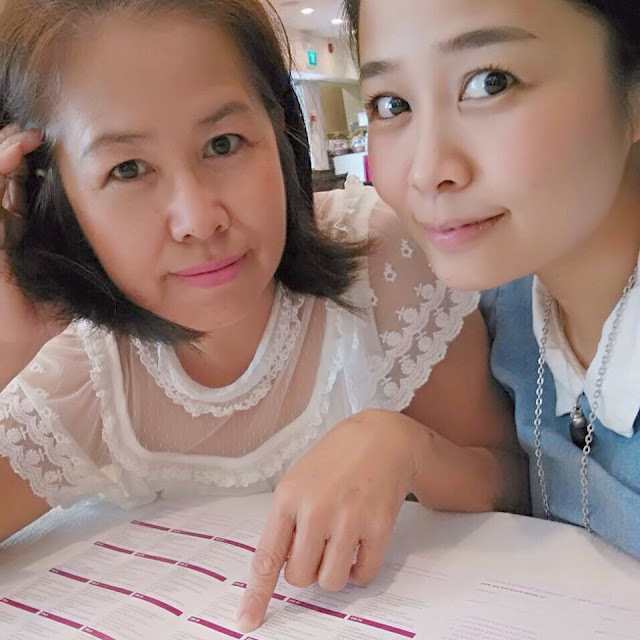 Being a mum is already one of the toughest job in the world, but ever since my Dad passed on (21 years ago), she took up the father's duty as well. So she is also my superhero. Despite having the world's toughest job, she raised the four of us with the best she could give. When I was much younger and rebellious, I often find my mum to be annoying and naggy. I don't always listen to her and she will always say "wait till you be a mum yourself, you will understand". Being a mother-to-be myself, I seem to understand her words now. She dedicated her whole life for us, she is the best I could ever asked for and I truly appreciate everything that she has done for me. 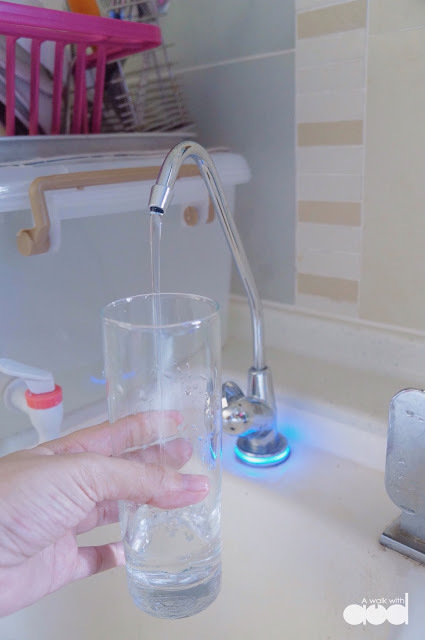 So in conjunction with parent's day, I decided to give her the best - a cleaner water and a healthier body with 3M Indoor Drinking Water System (DWS2005T-CN ) and Outdoor Whole House Filtration System (AP902) from 3M Malaysia. Water quality at home is always my concern. To ensure that the water is clean and safe, I need a good and reliable filtration system, which is why I choose 3M Water Filter System. 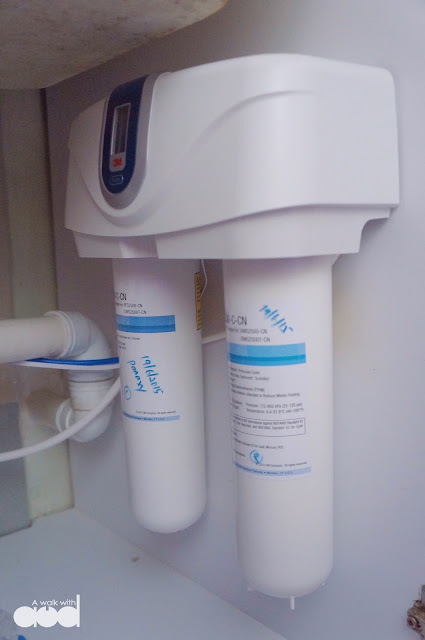 You may asked "how do you know if it's a good water filter?". Well, there are few things that one should look into when choosing a water filtration system. At the top of my list is always reliability. A reliable brand is caring and responsible towards their consumers. Reliability also means that the brand and their after service must be there when I need them. And that is why I chose 3M. 3M has been around for a long time and has over 75 years of track record in filtration system. It is a reputable brand synonymous with quality and credibility. Other than being reliable, it is important to make sure that the product claims are certified by a reputable, independent source – NSF. NSF certification is a non-profit, non-governmental organization that provides toxicological reviews, performance testing and manufacturing facility inspections before certification is granted. It is your key to ensuring that the products you use meet strict standards. Knowing that all 3M Water Filters are certified by NSF standards gives me the peace of mind. Water goes a long way to reach your house. It can be contaminated at any point along the way from aging pipes, rust, sand, and more. So, it is important to know that your water filter will be able to sieve out these impurities and bacteria. 3M Water Filter has two stage filtration that brings you cleaner, clearer, better-tasting drinking water. The first stage pre-filtration (white filter) process comes with premium pleated polypropylene membrane to reduce undesirable dirt, rust, particles and turbidity that may not be visible to the eye. The second stage is the fine filtration (black filter) involving IMPACT Technology- the revolutionary IMPACT media with superior filtration capabilities. The “IMPACT” media package combines a patented pharmaceutical-grade membrane to reduce 99.99% bacteria and cysts. With finer mesh or particle size, it only takes approximately five grams of 3M carbon to pre-filter water roughly covering the surface area of a football field. The pre-activated carbon block also removes chemical or chlorine in water, ensuring cleaner, clearer, better-tasting water! A main reason of getting a water filter is to make life easier, saving the trouble of boiling water. It defeats the purpose if you were to get a filter that requires much maintenance. Simple and easy is the way to go. 3M drinking water system has an inbuilt cartridge life monitoring system called the Smart Monitoring System. 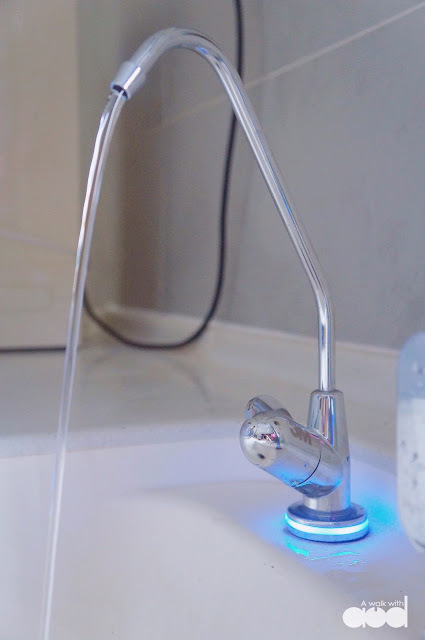 The dispenser faucet has a blue lighted ring that indicates the water is good for consumption. When the lighted ring turns to red (which is about once a year) it indicates that a replacement is necessary. It has an easy change cartridge system. Simply twist out the old cartridge and twist in the new. No tools required and it will be done in 10 seconds! Bulky water filters takes up much space in the kitchen. I've been using the conventional water filters and the size makes space planning in the kitchen difficult. 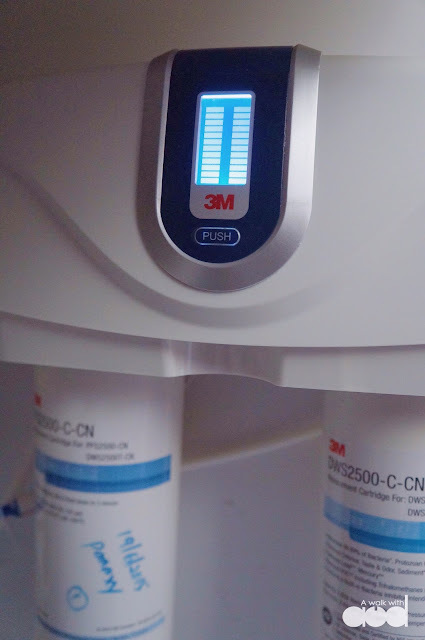 On the flip side, 3M Water Filtration System is compact and well designed. It requires just a small space and mine is sitting neatly beneath my kitchen countertop. I agree that budget plays a big part in the decision making. However, I strongly believe that a good water filtration system is a worthy investment for my family. 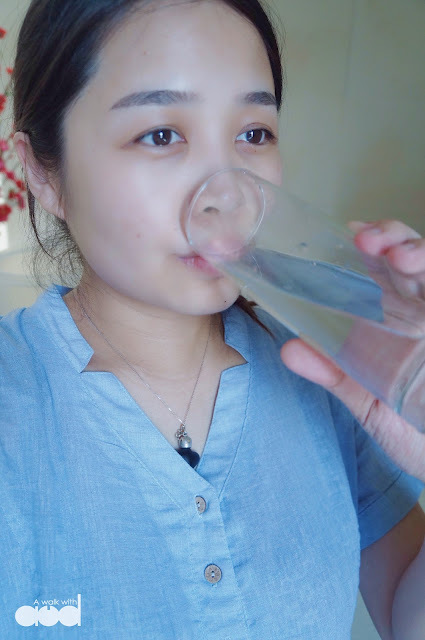 For the health and wellbeing of my family (including my coming new born), I decided on the 3M Advanced Drinking Water Filter (DWS2500T-CN) and a 3M Whole House Filtration System (AP902). It is probably the best home water filtration system in the market, and I wish to give my family the best. For those who are on a tighter budget, 3M has an entry level filtration system. An entry-level 3M drinking water system will cost about 26 cents per litre in the first year. After which, every litre is only 7 cents. Not that expensive for cleaner water, healthier body and happier family right? Now, if you want the best for your family too, here's the good news. 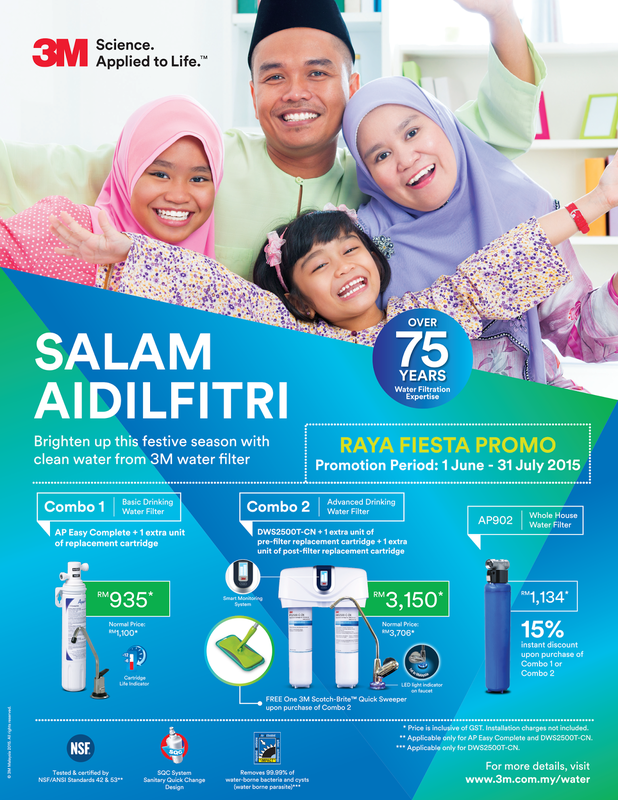 3M is currently running their Raya Fiesta Promo from 1st June – 31st July. You can check it out here, and the list of distributors that carries 3M water filters. Believe me, you'll be amazed by 3M science starting from a simple water filter. To find out more about 3M’s water filter, head on their website www.3m.com.my/water. *Update: 3M decided to give my lovely readers a cash voucher! You will entitle an RM300 discount when you purchase 3M water filters from participating distributors. Remember to print this Cash Voucher and bring it along to be entitled! Thanks dear!! We love it too! !